PEWA has turned north and weakened into a tropical depression. 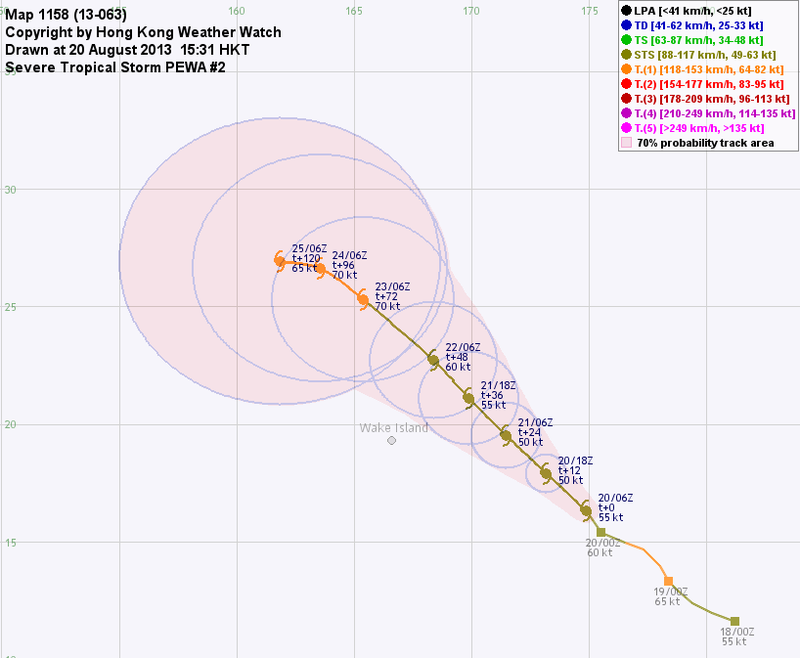 At 2 pm, PEWA was centred about 1200 km (650 NM) N of Wake Island. PEWA is the 34th name in the central north Pacific tropical cyclone name list (48 in total). PEWA is expected to go north along the western periphery of the subtropical ridge. PEWA's low-level circulation centre is fully exposed and clouds are thinning out. The storm is expected to weaken and dissipate in poor environment before having the opportunity to undergo extratropical transition. This is the final bulletin on PEWA. PEWA moved WNW in the past 24 hours. At 2 pm, PEWA was centred about 1050 km (560 NM) N of Wake Island. PEWA will gradually turn poleward again as the eastern ridge resumes dominance. PEWA's low-level circulation centre is fully exposed and clouds are thinning out. The storm is now forecast to weaken and dissipate in poor environment before having the opportunity to undergo extratropical transition. PEWA has slowed down significantly. 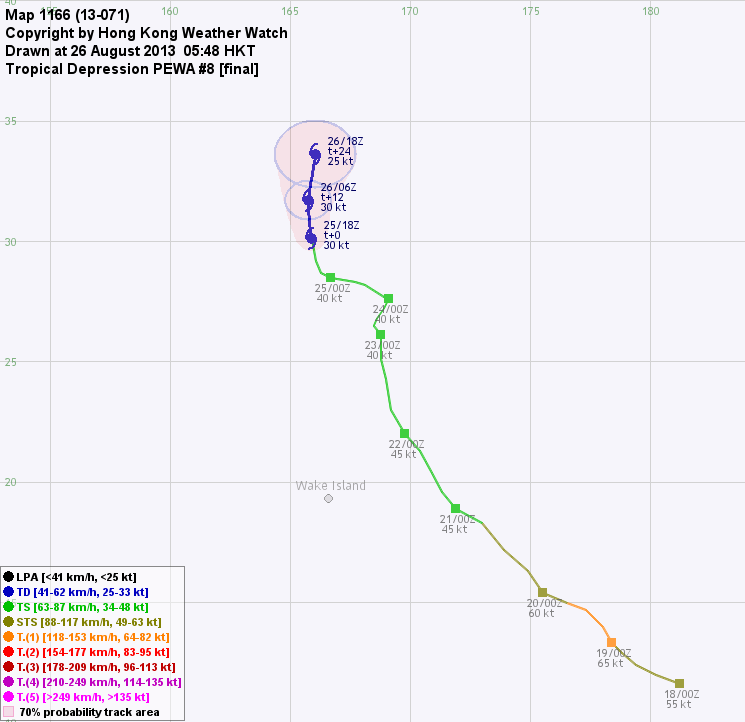 At 2 pm, PEWA was centred about 960 km (520 NM) NNE of Wake Island. PEWA is expected to move slowly in the next 48 hours within a pressure col, generally towards the WNW. As the trough digs deeper, PEWA will be able to escape from the col and recurve. Vertical wind shear continued to decrease, but PEWA appears disorganized. The storm is expected to maintain intensity over the next 48 hours with some chance of intensifying slightly. Thereafter sea temperatures will drop quickly and the storm will weaken. Extratropical transition is expected four days later. PEWA is still going north. 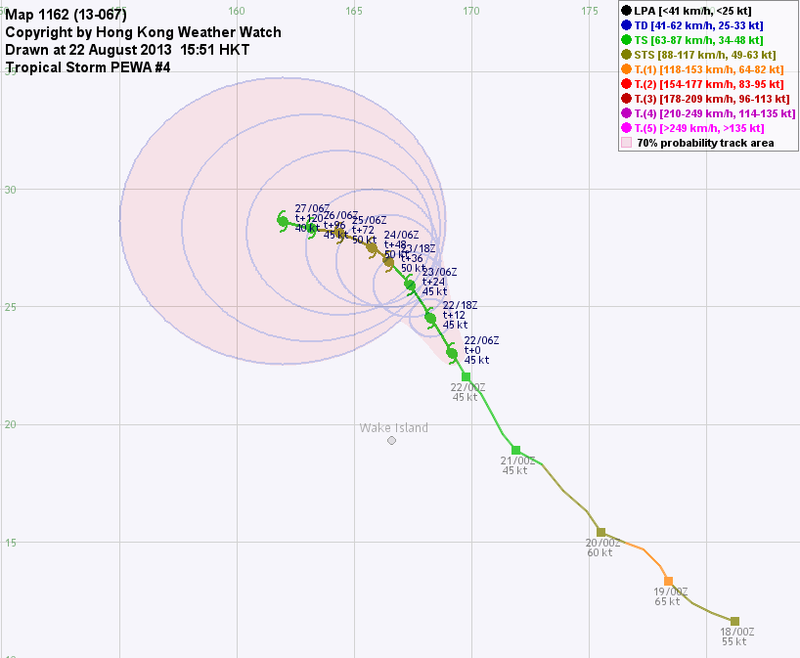 At 2 pm, PEWA was centred about 820 km (440 NM) NNE of Wake Island. The subtropical ridge has weakened and PEWA is expected to travel with reduced speed in the next 48 hours. Current forecast calls for a recurvature as the ridge to the right of PEWA dominates. Vertical wind shear has dropped and may allow some development. As the storm reaches 30°N, however, ocean heat content will decrease more rapidly and the storm will weaken. It is expected to transform into an extratropical cyclone beyond t+96. PEWA continues to travel NW to NNW. 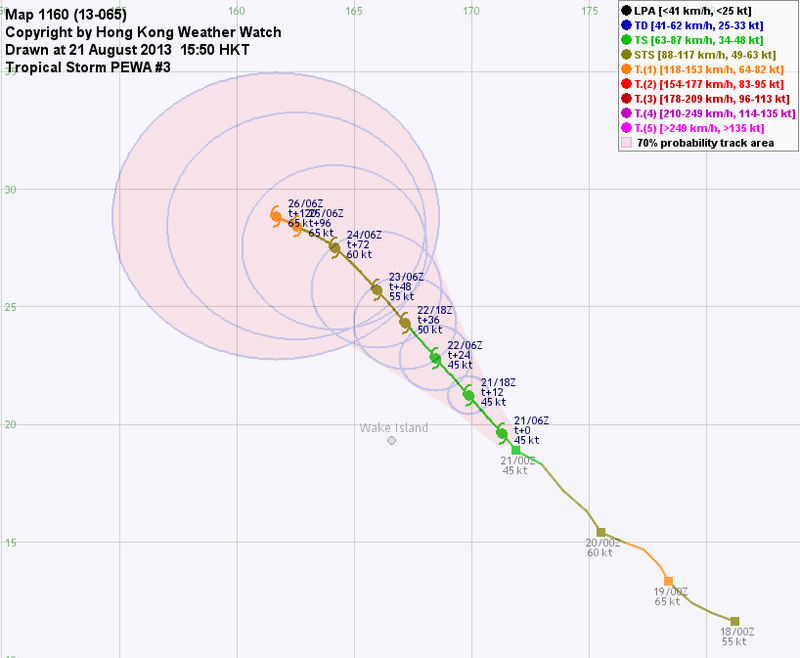 At 2 pm, PEWA was centred about 490 km (260 NM) NNE of Wake Island. The weakening of the ridge north of PEWA will create a col in which PEWA will stagnate beyond t+48. Shear is still very high northwest of PEWA and is responsible for the continual displacement of its deep-layer convections to the northeast. This situation is not expected to alleviate drastically, but the reorientation of the ridge and the improvement of outflow from the arriving trough may help PEWA to intensify slightly near t+48. 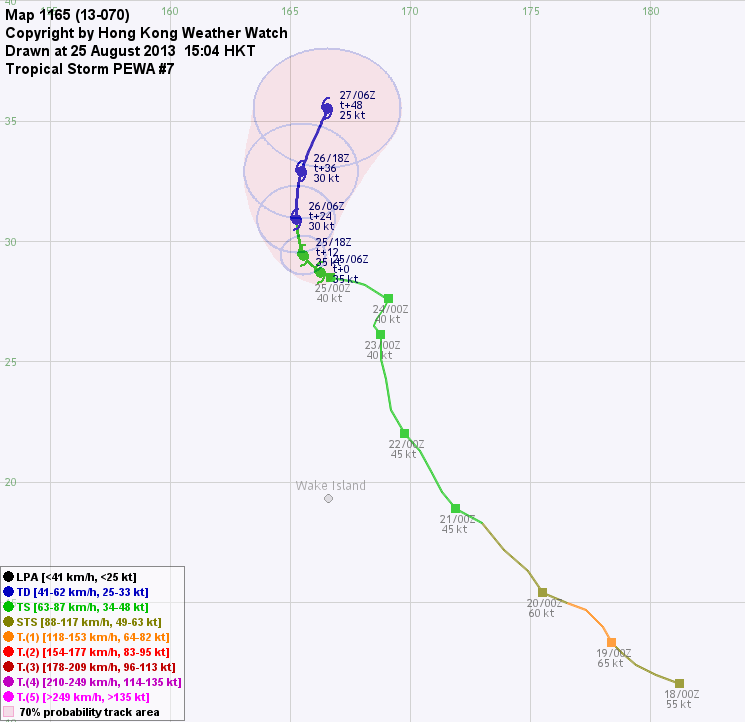 PEWA weakened further into a tropical storm. At 2 pm, PEWA was centred about 490 km (270 NM) E of Wake Island. PEWA is forecast to move NW along the periphery of the subtropical ridge. The ridge is expected to weaken two to three days later, which will see PEWA remain stagnant at later taus. Vertical wind shear is still causing PEWA to weaken but some convective bursts near the centre were observed over the past few hours. As the ridge weakens, shear is expected to relax and together with improved outflow there should be some room for intensification. PEWA has weakened into a severe tropical storm. 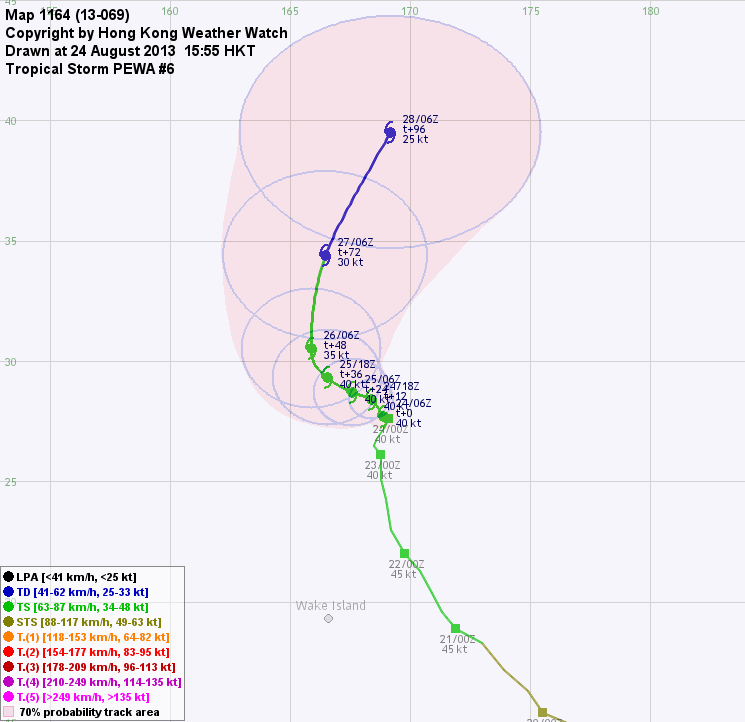 At 2 pm, PEWA was centred about 940 km (510 NM) ESE of Wake Island. PEWA is forecast to move NW along the periphery of the subtropical ridge. Some numerical models are predicting a weakening and reorientation of the ridge 3 to 4 days later and PEWA will then decelerate. PEWA entered a high shear zone which accounted for its decrease in intensity. As sea temperatures are high and outflow should improve due to a passing trough, the storm is still expected to intensify slightly at later taus. 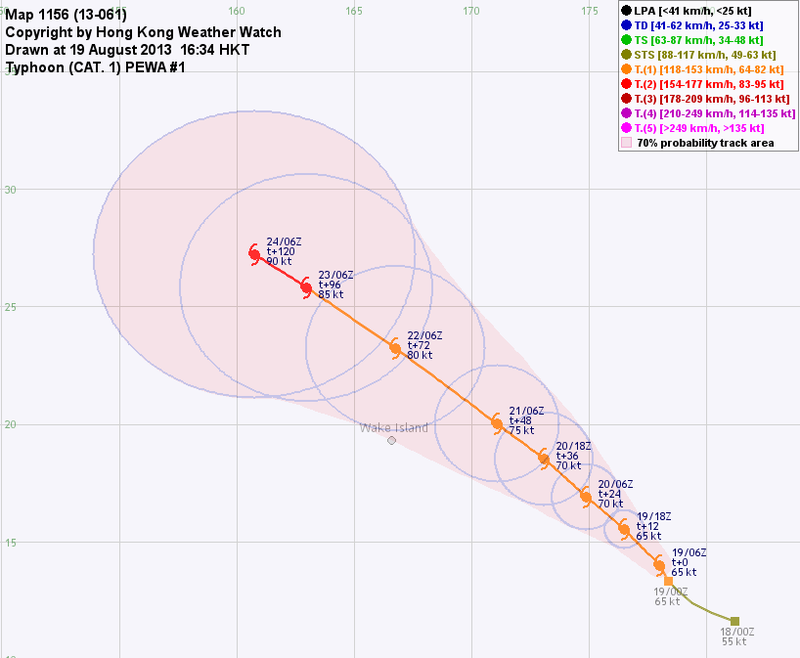 Tropical cyclone PEWA, the first cyclone formed in central north Pacific this year, entered the northwestern Pacific yesterday, and intensified into a typhoon today. 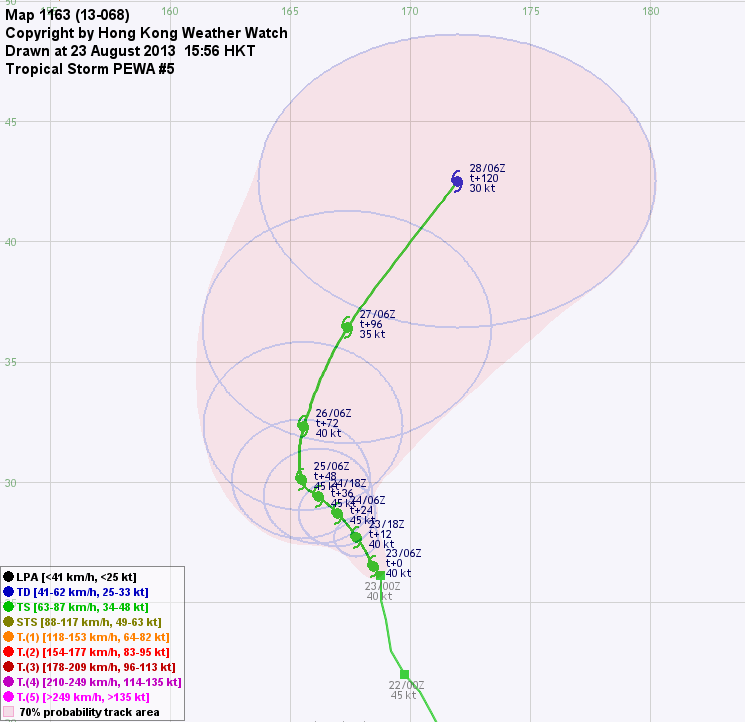 At 2 pm, PEWA was centred about 1350 km (730 NM) ESE of Wake Island. PEWA is forecast to move NW along the periphery of the subtropical ridge. Some numerical models are predicting a weakening and reorientation of the ridge 4 to 5 days later and PEWA will then decelerate. An eye was visible briefly, and convective banding justifies its typhoon strength. The storm is expected to intensify gradually in generally good environmental conditions.